My meditations today took me further than just my last post (“What Defines You“). In that post I made the statement that God is my center of being. While I certainly felt that statement was true at the time that I wrote it … I also felt that those words rang a little hollow as I thought on the subject more. To be truly guided by God, for God to completely be your center … you must be dependent SOLELY on God. I cannot make such a claim. To be dependent solely on God means that you go wherever God sends you; whenever and wherever that may be. That means that you must leave everything else behind to go wherever it is that God sends you. At the moment I don’t feel that I am in a place in life where I can do such a thing … we each make decisions that tie us to responsibilities … therefore the claim is not complete. Not yet. I am confident that I am where God wants me to be, and that I am headed in the direction that God wants me to go … but being completely centered in God is NOT something that I have yet attained. I trust though that such a place is where this path I am on is headed. The thought also came into my mind that you may not WANT to go where God wants you to go. The prime example of this is Jesus. Jesus did NOT want to die on a cross. In the Bible, it is detailed how Jesus went to the Garden of Gethsemane to meditate and spend time with God … to beseech God for some other way; ANY other way. God had made it clear though what needed to be done … and so that is where Jesus went … no matter the cost. Do I have such strength or conviction? Do you? I really don’t know … I haven’t been asked such a thing, so I could not say. However, to make a claim of being centered in God ultimately means being willing to go wherever God wants you to go. So I guess I ASPIRE to being completely centered in God (lol) … and I feel infinitely more centered in God than I have at any other point in my life. There is still quite a ways to go though, I am sure of that! 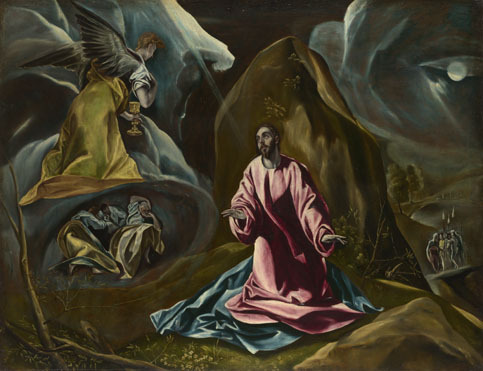 Painting by: Domenikos Theotokopoulos, known as El Greco, being shown at The National Gallery in London. * DISCLAIMER * Please know that I am not saying that God wants to send everyone to their death, or some catastrophic event! Not my point here :-). Where God calls you to be may be right where you are … that is the case in my life right now. None of us know where God will call us to be though … that is more what I am getting at … we simply have to let go, and trust … and then respond when we are called. I utterly agree with you. And I think we need to remember that God sees the path ahead of us and we often dont, so by simply remaining as unattached to places and situations as we can manage, we are able to follow Him more easily when change is called for. It is not easy. But/and I also believe that we are never called to do more than we are capable of. Whilst we may feel very inadequate faced with these challenges, He knows we are up to them! Yes, more often than not it is about waiting for Divine timing to unveil itself. What we may not be ready for now (if we follow the inner promptings that God gives us along the way) by the time it actually arrives, we surprisingly find ourselves more than prepared. If we force things to try and be our way, however, we make them happen prematurely … and then get in WAY over our heads :-). God knows … and it is up to us to simply let go and follow. I’m really trying to let go and trust. I think I’m doing the best I’ve ever done- but there’s still a long way to go!! Several times now, in meditation, I have gotten the visual of being suspended over a pit, or deep crevice. My hands (which really is my brain) are clutching and grasping. Then I stop, and MAKE myself let go … the actual feeling of falling at first would make me flinch … I would fall and fall … until I realized, that I’d never landed! I really was sort of hovering. The picture changed to a Hand cupped underneath me … always there, ever supporting. It’s a constant process really … once we do it for one thing, a myriad of other things will come to the front. It’s like a whole series of things that have never been let go before … once you do one, they all queue up to test your resolve. You’re in the right place, and doing the right thing … it’s just perseverance :-). This reminds me of my childhood nightmare. At least that’s how I saw it as a child. I was falling down a hole, a deep dark hole, but there was always a mattress ahead of me. People threw ropes, even fireman, but I never landed. If I had, the mattress would have cushioned my fall, I presume. It certainly is a frightening experience … the ultimate Trust Fall. 🙂 Thank you for sharing! If I had a pound for every time I have flung at Gods request of me to do something, “WHY Me? Cant anyone else do it?” I would be a very rich woman. I can imagine poor Jesus doing the same in that garden! Yes, I think it is an especially striking portrait to realize that Jesus did NOT want to proceed … that he wanted God to lift this burden from him … that he spent an entire night beseeching God … but then, still followed God’s guidance. That is the very definition of courage to me … to press on, no matter how afraid, or disconsolate, or alone, or rejected.